Taxes generated per acre by different urban forms. “Where Urban Amenities Meets Small-Town Living”. That phrase, which fits Princeton perfectly, is in fact the motto of Sarasota, Florida. 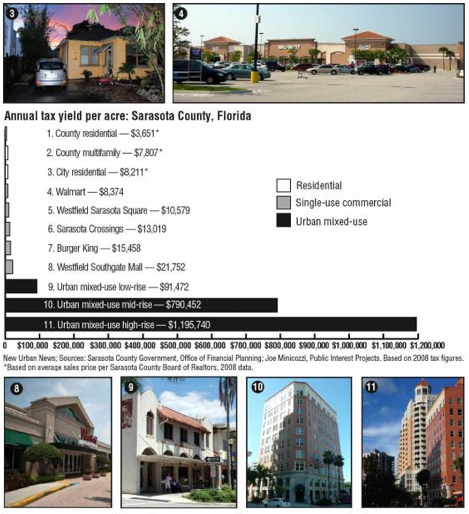 Sarasota, a community of 56,000 people, is itself the major urban center of Sarasota County. Unlike the Princeton area, Sarasota County has a wide variety of urban forms, ranging from low-rise residential houses, to fairly significant skyscraper-type towers. This allowed the local authorities to measure how much tax revenue could be generated from buildings at different densities. As shown in the graphic above, taller buildings bring vastly more tax revenue than low-rise residential houses. A ‘mid-rise’ building (defined here as 10 levels) was found to bring in 10x the tax revenue per acre of regular residential homes. In Princeton, we spend quite a lot of money on excellent schools, our award-winning library and parks. We pay for this with pretty high taxes. Some of us would like to spend even more money, to provide more parks, further upgrade our school facilities, or add bike and walking trails. Other people in the community would like to give homeowners a break by cutting taxes. Either way, we give ourselves more flexibility by allowing buildings to rise a little higher. 10 levels is too high for Princeton. Most people here don’t want that. But buildings at 5 or 6 levels already exist in our downtown area. This height would seem to be a reasonable balance between keeping a small town feel and realizing the tax benefits of upgraded zoning. As evidence from other localities clearly shows, “Density = Dollars”. This entry was posted in Density, Zoning. Bookmark the permalink.